Unlike professional restaurant critics, I'm allowed to admit certain biases. One of these, which I'll readily confess, is that I tend to prefer chef-driven restaurants to concept-driven restaurants. A chef-driven restaurant is one that starts with the chef: the menu, often even the environment, follow from the chef's personal vision, which is more often than not centered on the food. Michy's is a chef-driven restaurant; Naoe is an even more extreme example. Concept-driven restaurants start with an idea: a marketing ploy around which everything else is assembled. The chef, typically, is simply a cog that fits into the wheel of the restaurant's concept, the menu just a piece along with the decoration, the music, the drinks, the scene. China Grill is the prototypical concept-driven restaurant. No doubt my bias toward chef-driven restaurants is naive and overly romanticized. After all, chefs (and their backers) want to make money just like everyone else. But as someone who cares mostly about the food, I've learned that the odds of finding the best food are improved by going to places where the decisions are made by the person who creates it. Sugarcane Raw Bar Grill, the new spinoff from the creators of Sushi Samba, is a concept-driven restaurant. But I'm not too proud or stubborn to admit that it's a darn good one, one for which the food is far from a mere afterthought. Located in Midtown Miami, Sugarcane occupies a long space whose voluminous feeling is multiplied by the two-story high ceilings, with rattan fans turning slowly overhead. There's a large indoor/outdoor bar as you walk in, with most of the main space bisected by a row of red leather-clad banquettes. Off to the right side, backed by a stone wall, is a raw bar with seating around it. Toward the back is the robata station, housing a sizable grill under which they burn Japanese bincho-tan charcoal (which generates high heat without much smoke). Off to the left is still more seating. The decorations have the purposefully haphazard look of a very expensive haircut, with mismatched chairs and partially painted walls throughout. (Some of those mismatched chairs, I will note, are too tall for the tables, leading to a hunched-over seating posture more conducive to hard-nosed contract negotiations than dining). The "concept," I suppose, must be tapas with a Japanese tilt, though the influences are more global than the Brazilian/Japanese mashup that characterizes Sushi Samba. 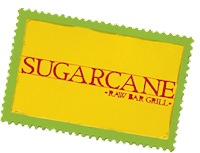 The Sugarcane menu is pretty much exclusively comprised of the "small plates" that are taking hold on so many local menus lately. It is divided among "snacks," "tapas," "robata grill," and "raw bar," the last of which includes traditional raw bar items, crudos, sushi, sashimi, and rolls. A blackboard features a short list of entreés, including a roasted chicken that has been getting raves all over twitter of late. Food comes from either the raw bar, the robata, or the hot kitchen, and like a tapas bar, items come out as they're prepared. This orchestra is directed by Chef Timon Balloo, whose resume includes stints with some of Miami's big name chefs (Michelle Bernstein, Alan Susser, Tim Andriola) and at Sugarcane's local cousin, Sushi Samba Dromo on Lincoln Road, before he took the helm at the now-closed Domo Japones. I've not tried that roasted chicken yet, but I have tried most of the rest of the menu during our two visits. Among the snacks, edamame come out steaming hot and generously salted. Even better may be the shishito peppers, their skin blistered, and brightened with a squeeze of lemon and big flakes of (Maldon?) sea salt. From the raw bar, a half dozen Blue Point oysters were presented on one of those impressive seafood tower contraptions with a raised stand and a gigantic bowl of ice. Accompaniments were simple: lemon, cocktail sauce, horseradish, mignonette. The conch salad was light and refreshing, strips of the mollusk matched with orange segments and shreds of lettuce or cabbage. Opinions were mixed on the fluke crudo, however. Four ribbons of the flatfish were presented over a strip of kombu (with which the fish may have been lightly cured), resting on a rectangular bed of ice, each ribbon of fish topped with a halved grape, a drizzle of amazu (a sweetened vinegar) and purple shiso. I thought its flavors were elegant; Mrs. F thought it bland. Elegant or bland, it was a bit overpriced for the portion size at $13. Some of the best things we had were from the "tapas" section of the menu, which traverses all over the global culinary map for inspiration. Steamed pork buns, the succulent pork topped with brightly flavored apple kimchi, were a delicious hot mess, though possibly not as good as the ones across the street at Sakaya Kitchen. The "kobe beef sliders" were slightly less messy but just as good, served still pink inside and topped with an umami-loaded tonkatsu sauce and a fried quail egg. Bacon wrapped dates (the official snack of the nearby Design District) were obscenely plump, stuffed with savory minced linguiça and manchego cheese. A New England lobster roll was bedecked with a fennel and celery salad that was a perfect match for the crustacean, the only possible complaint being that perhaps some more lobster was warranted for a $12 sandwich. A brandade was creamy and flavorful without being overwhelmed by fishyness or garlic, not an easy balance to achieve. Florida tomato salad with burrata and strawberries was a lovely composition, with the burrata oozing its creamy goodness into an assortment of colorful tomatoes; the slivers of strawberry were a smart complement, sweet and tart to the tomatoes' tart and sweet. Golden beets with braised romaine and burrata was another intriguing combination (yes, two burrata dishes; Little Miss F is mental for the burrata) which I thought succeeded. Good things also come from the robata station. An order of chicken yakitori brought a skewer of plump, perfectly cooked cubes of skewered chicken breast, in between which were sweet slices of negi (a fat Japanese green onion similar to a leek), enrobed in a not overly sweet tare sauce. Short ribs were done in the style of Korean kalbi, sliced thinly across the bone and brushed with a lightly sweetened soy sauce. Octopus with Peruvian aji panca sauce had a nice char to the exterior, though I felt the sauce could have used a touch more heat. Cauliflower also found its way onto the robata, here draped with a pungent bagna cauda, though the plump florets seemed more steamed than grilled. For some reason, a thin-crust flatbread topped with cured tuna, tobiko and sour cream is also listed at the bottom of the "robata" section of the menu. It's perhaps better not noticed, as it was bland compared to the other offerings. Of course, those of you who know me won't be surprised that I'd like to see some more exotic cuts of meat and offal being thrown over those coals, but that probably wouldn't quite fit with the "concept." The weakest section of the menu is the sushi offerings. We tried a few rolls, and I was impressed with none of them. The primary flaw is the rice - cold, sticky, and gummy in a yellowtail jalapeño roll, and made even worse when apparently deep-fried in a crispy spicy tuna roll served with a sweet chili dipping sauce. Given the number of things we tried in only two visits, it shouldn't surprise that we had little room left for dessert. We tried one: a vanilla panna cotta with clementine soda and sesame ravioli. The vanilla and clementine made for an uncanny imitation of the flavors of a Creamsicle, with the sesame ravioli providing an intriguing, more grown-up note of contrast (one, I should note, which neither Mrs. F nor Little Miss F were particularly fond of). There's a diverse selection of more than 30 beers, divided like a "progressive wine list" into categories ("crisp and refreshing," "fruit and spice," "balanced and flavorful," "full and rich"), several "signature" cocktails mostly revolving around tropical fruits, sangrias, margaritas, caipirinhas and mojitos by the glass ($6 for sangria, $9 for hard liquor drinks) or pitcher ($30/$45), and more than 25 rums to choose from. The wine list offers a decent selection, though markups vary wildly from the reasonable to the extreme. There are also six sakes available by the glass and even more by the bottle. Service - even if you don't announce yourself as a "Twitter VIP" - was attentive and did a good job of explaining the menu and the "concept," including that dishes come out as they're finished by each of the three kitchens. As noted in a footnote below, we got to see the staff in action with a high-maintenance table, and thought everyone acquited themselves perfectly (and, I should add, so thought the high-maintenance diners themselves, who said as much to the manager). Presentations are also worthy of note, with many dishes presented on a beautiful variety of different pieces crafted by Earthborn Pottery in Alabama. Though prices on an item by item basis are perfectly reasonable, with most dishes under $10, it takes several to compose a satisfying meal, and the food portion of our bill averaged around $40 per person on our couple visits. Given a menu as wide ranging as Sugarcane's, it's not surprising that some items were more successful than others. But if you stay away from the rolls, and gravitate toward the tapas and robata items, you ought to eat pretty well, as there are many winners in these particular territories of the menu. That's a concept I can whole-heartedly support. Restaurants, please: if it doesn't come from Kobe, Japan, don't call it "Kobe." Having now recently tasted genuine Kobe A5 beef at Bourbon Steak (that report will be coming soon), it's quite literally a different beast entirely. A brief aside: shortly after we began our first dinner at Sugarcane, a couple was seated at the next table over. It became immediately clear that this was an extremely high maintenance table: twenty questions for the waiter, and I'm pretty sure some drinks were sent back multiple times. Never rude, but enough to provoke some mutual eye-rolling between Mrs. F and myself, and enough to cause a manager to visit to make sure everything was OK. The clincher was when they sent back an order of the cauliflower with bagna cauda because one of the diners didn't like anchovies. This would not necessarily be worthy of mention but for two things. First: the staff's handling of this couple was perfectly patient and professional. And second: I later figured out that one of the diners was cookbook author Steven Raichlen. How the hell does someone who has published 28 cookbooks not know that anchovy is a primary ingredient in bagna cauda (which sauce was listed on the menu)? I suppose one of the other perks of not being a professional restaurant critic is that I could introduce myself as a food blogger in the hope of being fawned over. But I don't. Frankly, that kind of attention just makes me feel uncomfortable for a number of reasons, though I understand some people thrive on it. Sugarcane clearly does a good job of catering to them. The restaurant has an active Twitter presence (@sugarcanerawbar), which they use not only to announce specials, happy hours and the like, but they also constantly note and follow up on mentions of the restaurant in the Twitterverse. Smart, savvy marketing. Your "Twitter VIP" comment made me laugh. I tasted a couple of bites of the chicken. It wasn't bad but maybe because it's been so over-hyped I was expecting poultry heaven and it wasn't. My favorite dishes from what I ordered were the pork buns and the PEI mussels. Did you by chance try the veal meatballs? I didn't try the mussels or the meatballs - or the sweetbreads, which another diner next to us on our second visit was a fan of. I did see the chicken come out to a table on of our visits and it looked good, but that doesn't tell you much. My favorite item on the menu was their grilled sweet potato. So good! I was really impressed and didn't expect to be blown away as much as I was. Service was also VERY attentive and knowledgeable, which I appreciate and expect at high-priced restaurants. I have to agree on the service. I was with a party of eight and our server was very attentive but also had a great attitude in dealing with all of us and our million questions. I have a hard time believing their chicken can be better than Michael's up the block. Can't wait to get here though. Were the pork buns of the clamshell variety or the closed ones?